Besides being a Realtor, many of you know I love decorating. Staging homes for my Sellers is awesome but decorating at Christmas….My heart goes AHHHHH!! I have hosted probably 30 Christmas Boutiques usually stocked with items I have made myself. But now that I’m no longer making decorations I can share with you my little tips. That would give me great joy. Her table is simple…notice no Table Runner. The centerpiece is one I made her years ago and it’s become a staple on her table. Bring in the her dishes with some Christmas colors, china and some stemware and a few Ornamental embellishments and she has a beautiful and simple Christmas table. If you don’t have a centerpiece spray, check out this idea. Who doesn’t have Mason Jars!! I Love this table. I have done this same table in different ways. The mason jars are sooo simple. You can either use snow from Michael’s or even soap to fill your jars. Clippings from your spruce, cedar or your own Christmas Tree and then of course cranberries. A few Votive s and that’s it. Because the table centerpiece is more natural, the chargers are simple basket woven. Add your own Christmas dishes and your favorite napkins. Tie with Jute and that’s it! Here’s a twist…put your cedar clippings in water with cranberries floating then add your votive!! Cute!! These jars are actually placed right on the same clippings for texture. Add a votive and its magic. Now with all the affordable battery operated candles on timers, it makes it much safer. FYI… Did you know CVS has flame less flicker candles for $19.99!!! The flame doesn’t move like PB candles that start over $50, but who cares!! I certainly don’t! When I bought mine I got the second one 1/2 off!! Just saying! Table settings can really vary as well…I love these chargers from Sawdust Angel. I love the layering of the place settings. White on white with ship lap chargers that can be used all year long. I also love the simple wreath and pine cone. You can use a dime store Christmas kitchen towel for a napkin. Wow!! Check out Sawdust Angel @sawdustangel if you’re interested! Here’s another sweet use of the same wreath! Simple but so festive..Also a great gift for your guests. Hang their place cards on each wreath for seating. Different and fun!! This next place setting is one of my personal favorite because it was my grandmothers china mixed with some plaid towels and table runner. My Mother had given this Christmas China to my Grandmother and I was blessed to inherit the China…I love them! Mixing fine china and dish towels…who’d of thunk it! So lets create your Christmas Table…you don’t have to use the same elements I have but the concepts will always be the same. DIY Christmas Table setting!! Ready? This Christmas Table setting is beautiful enough for fine dining but rustic enough for your breakfast nook. This table setting is easy..Burlap purchased at Lowes can be made user friendly by spraying it with a solution of 1/2 Glue and 1/2 water. It really cuts down on shedding. Perfect width for my table. These wood chargers were ordered online and came really rough. I sanded them and then used Min wax but for a final seal I used food safe mineral oil. It protects the wood and your guests. The napkins are hand towels purchased from Ikea. You fold them in half, then fold 2 inc. down from top, an then into thirds. Tie with ribbon or in my case jute and embellish with small ornament, given to my guests as a gift. These place card holders are super easy. You can purchase birch branches from Michael’s. Look for the coupons and save big. cut into 3 inc pieces. Drill small hole into top and place tie wire you can get at any home improvement store. Twist the end into circle and glue straight into wood. That simple. Print with Cursive script for each name. Add some Trees, candles and votive and that it!! I made this 4 ft box that holds my dishware and chargers ready for the big day. Whenever I do an Open House I always have something Home Baked on the counter. I may even sometimes ask the homeowner if I can bake a batch of cookies in the oven prior to the Open House to get that fresh bakes smell. After all, who doesn’t love the smell of fresh baked cookie when you enter a home. My oldest grandson Shane told me one day as he walked in the door, ” I love coming to your house, It always smells like Christmas” Ahhh there goes my heart!!! So every year around October I start thinking maybe I should lose a few pounds to get ready for the Holiday Season fast approaching! I’m kidding sort of! I know I’m weird!! Yep, I love to bake and try out new recipes! I pull out my Holiday Cook Books and start baking. One of my favorite memories as a child was going to my grandparents house and finding amazing baked desserts on the kitchen table. We were not allowed to touch!! I was determined I would have my own table or island now full of desserts and not only let the kids dig in but teach them some easy fun recipes throughout November and December! We are all so busy I thought how fun would it be to share our favorite Christmas recipes… Through my blog !! It’s like an online cookie exchange in a way! Here’s a few of my favorites…Let’s get started! I admit, I use store bought pie crust and Puff Pastry! Yes I said it! 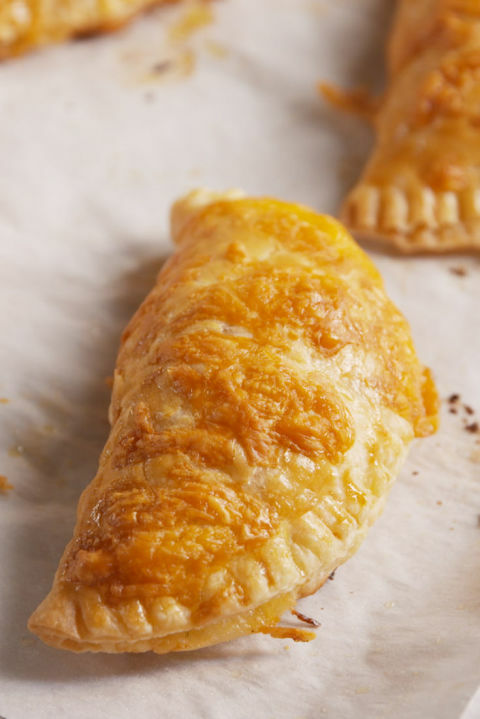 That’s why I call it Faux Hand Pies…It’s OK. I just gave you permission to do the same…See how that works! Ok, so this is the easiest recipe ever. Each box of Pepperidge Farm Pastry Puff has two sheets. Depending on the size of your cookie cutters you can get at least two pies per sheet with some extra for smaller cookie cutters. I usually get two boxes. With each cookie cutter, cut out 2 pastries. If you make Chocolate pie, you can put in around 7 wavers per pie. Put the second cut out pastry on top. Then whisk the egg and with a cooking brush dampen the edges to get a good seal and use a fork to crimp the edges.. Brush the top with Egg and Sprinkle Sea Salt. That’s it!! You can make your own fresh fruit filling with berries or apple or you can just get store bought pie filling…. Especially if you need a quick dessert that looks impressive. Strain the apples in a colander over a medium bowl to catch all the juice. Shake the colander to get as much liquid as possible. Return the juices to the skillet, and simmer over medium heat until thickened and lightly caramelized, about 10 minutes. Add the berries. Stir gently so you do not break down the berries completely. If you don’t want to use a cookie cutter, cut each sheet into 4 parts. Cut inn half and then half again. Fill and fold into a kite shape. You will actually get more pies out of each sheet that way. Actually 4 per sheet. Use a fork to crimp the edges to seal. My grand kids like to make multiple flavors. Chocolate, apple, cherry …combinations of all three…they turn out really yummy! Pierce to let the steam out! Give them a wash of Egg to make golden brown. Decorating is fun using the pre made crusts. I have to admit…yes home made is better but in a pinch, this is fine. This is so easy!!! Us your Cookie cutters and overlay your cutout using egg wash to keep them from separating.. sprinkle with sugar…that’s it! If you don’t have a cookie cutter, make a template using a paper bag. This Holly Leaf was made with a template I made. Outline with a knife and cut it out. I added little balls of dough for the berries. Have fun, and send me pictures!! With this Cookie Dough Bar you are not running the risk of that icky tummy ache you get from the raw eggs in regular batter, and are rewarded with the most incredible treat that has ever hit your mouth. Add to that a nice little shot glass of milk and you are in for a real treat! Combine the peanut butter and ½ cup chocolate chips in a microwave safe bowl. Microwave on medium-high and be sure to stir every 30 seconds until melted. Pour and spread using your offset spatula over the top of the chilled dough. Chill until topping has hardened. Thanks Olive Blogger for sharing this great recipe! This is my idea. Under comments, share recipes and photos of baking your favorite dessert and I will post it on one of my blogs as we get closer to Christmas! Until then, have fun baking. Have a cup of coffee and enjoy your treats. Hopefully not to excess like I tend to do. After all, there’ is always the New Year!! Next Post…Dressing your Christmas Table! Traditionally, realtors have believed the season between Thanksgiving and New Year is not the most wonderful time of the year for those eager to sell their homes. Many homeowners typically delay listing their properties until January or even take them off the market for the holiday season. With mobile apps that’s all changed!! Today’s buyers can continue their home searches in the midst of holiday festivities with the help of the internet. Contrary to popular belief, sellers who weather the real estate market during the holiday season may enjoy several advantages. Less Competition!! If you are facing a holiday season with your home on the market, I want to share with you some tips!! OK, so I may not be so good at that when I decorate but I’m not listing my home. Remember that your home is the centerpiece, so any decorations should merely complement the property rather than dominate buyers’ focus. I would never put out wrapped gifts, but put out some nicely wrapped boxes putting yours safely away! The holiday season is a rich sensory experience, full of sights, sounds, and smells that induce feelings of comfort and nostalgia. Keep the temperature inside your home warm enough that visitors will be comfortable, open the blinds, and turn on plenty of lights to counteract the season’s dark and chilly days. Consider placing a few flameless candles around your home in order to foster a cozy vibe and baking cookies in advance of a showing so that an inviting aroma lingers. We’re lucky that in Southern California, we don’t face the same obstacles as other parts of the country…My yard thrives at this time of the year so it’s really a matter of keeping the lawn green and mowed. If you don’t have a gardener, it may be a good idea to just hire one for a good clean up. Have him plant some flowers that will grow through the holiday season! Showcase how your home looks in other seasons OK….so I posted this photo of my house during a boutique….But you should provide photos from all seasons in your listing materials or in a photo album or slideshow that you have available when buyers come to view the property. The bottom line is just because your home is on the market does not mean you can’t enjoy the Holiday Season…. Your buyer may be just around the corner!!! I love coffee mug racks and have always wanted one. Above my desk on the side of my pantry I have a small section that I thought just might work to hang one. So I started to search. I checked out Magnolia Farms , Dot and Bo and various other online sites that I thought might carry one. Either they were too large or to expensive. And several were out of stock. I then went to Pinterest and I did like several of the racks that were posted. But the cost of the hooks you would need can really add up. Yep that’s it. So why not use the hinge pins for cup hooks. Add metal lettering and you have a pretty neat coffee mug rack for very little money. Industrial Farm Coffee Mug Rack. First step is to find your wood. Whether distressed wood or new, the size of your wall will determine how big you want your rack to be. The wood I used is 5 inches wide, so I doubled the width. The length again will be decided by where you want to display it. My area was pretty small so I cut the wood 30 inches in length. Completed size 10 x 30. Measure wood to the length you want depending on how many cup hooks you want on your rack. If you use distressed wood, you must first sand & clean it with soapy water, let it dry. If not painting the wood, seal the wood with food safe mineral oil or Min Wax also works as well. You could also seal with Polyurethane but I don’t like the finish. That’s just a personal preference. I painted mine with a White Satin paint for easy cleaning. I lightly distressed just the edges. In this picture you will see there are two wood mounts under the front piece that I ended up removing because it didn’t lay flush with the wall. Trial and error. I used metal fasteners instead and it was super easy. You can fasten these metal straps in 2 minutes! Now it is easily hung flush to the wall. Painted white I then started to think about lay out of the hinge pins. I wanted at least 8 but that was determined by the size of my mugs. Measure how many cups you can hold. This rack will have 8 pins. I wanted to either attach metal letters for the industrial look or you can even paint on letters spelling Coffee with Chalk Paint. Save even more money that way. I got these great metal letters from Far Away Hood. They came raw metal so I sprayed them black. Love the industrial look. Like I said before, Lowes has Hinge Pins, 4 per package. For the size of rack I knew I would only be able to have 8 cups. So total cost of 8 pins, $1.96…no kidding! Find your drill bit to measure the size of your hinge pin. Measure where you want each hinge pin to be placed. Make sure you allow for the cup to actually hang. Drill at a 45 degree angle trying not to go through the backside of your wood. Drill at 45 degree angle being careful not to go through back of wood if at all possible. Now this is important! Dampen each hole with water, then put a small drop of Gorilla Glue in each hole. The water helps activate the glue. Tap in each hinge pin making sure they are each secure and at same level. Now walk away and let it dry. Don’t touch it!! I know you want to! Tap in each hinge pin making sure they are all same level. Because I didn’t want to put a hole in my cabinet, I used 3M adhesive strips and they really work!! Now the rack is flush to the wall and really secure. This isn’t coming down with an earthquake! If your rack is larger you may want to use picture fasteners. You just don’t want it to lean forward. Rack mounted with 3M adhesive strips. TA DA!!! At there it is..ready for coffee, tea or hot water,lemon and honey! Industrial Farm Coffee Mug Rack made so easy! An afternoon project that seriously cost a fraction of any I’ve seen. Try it out and let me know how your’s comes out. Send me a picture. I’m attaching the link for the hinge pins and letters to make it easy. In all my DIY’s, if this is something you would love to have but just don’t want to make it yourself, contact me under comments… Would be happy to make one for you! I’ve been asked several times to teach classes on how to make some of the items I have sold in stores or at local boutiques. I thought it would be fun to do just that…only through the blog. I will add to the list as I go but here are some really fun and easy DIY projects I will be doing in the coming months. Let me know if you have something you want to make!! Made out of old fence wood, hinge pins and metal letters from Far Away Hood..
Cup rack made with re cycled wood, hinge pins and metal letters. I have very little wall space so I made mine narrow with just 8 hooks…you can make yours any size to fit your wall dimension. I don’t have much wall space so I hung this rack on the side of my desk..
2 ft Lap Tray can be used for eating food, working on the computer or kids doing homework. Or how about on your kitchen Island! Same tray on kitchen island…that’s table top! My table is narrow so I made this 3 ft White tray. I wanted to be able to arrange my place settings on each side so this size was best for me. Industrial Table Tray on Casters can be made 3 ft or 4 ft. Love using this for table settings, decorative displays or even cheese tray..anything goes! This 4 ft Natural Wood tray used on island for Christmas Decor by my daughter in law in their kitchen. This tray is my daughter in laws. She has it on her island shown here decorated for Christmas. This tray is also 4 ft. Natural wood and was purchased at my Christmas Boutique this year. The sweet gal who bought it used as Cheese Platter on New Years Eve and sent me a picture. So thoughtful! A gal who bought this 4 ft tray from me at my Christmas Boutique sent this picture to me from her New Years Eve party..Great Idea! After the rain is over, it will be fun to get out in the garden! My Hannah made her Fairy castle with sea glass and shells. Great DIY with my granddaughter Hannah.. Don’t throw out your broken pots…make a fairy garden! Madi made hers out of broken Candle Holder, sea glass and anything else she found! So fun to watch them create their little gardens! Granddaughter Madi made the top of her Fairy Castle out of broken candle holder. 18 inch industrial box made from old fencing and plumbers pipe. Great look with multiple uses…wine bottles, stemware, or how about succulents! This Distressed Wood Box with Pipe Handle is great for carrying Wine, Vinegar or even Plants! I made this Industrial box for my son Josh for Christmas. I put a great bottle of wine from Paso Robles and vines to plant in his garden. My daughter in law decorated it with faux succulents and put in bathroom. When she has a party she can easily take out the succulents and put wine bottles back in! This industrial box was a gift to my son Josh fro Christmas with Wine in it but has since been used to put in fake succulents for an awesome display in their bathroom! So this is a start..I will add as I go and let me know if you have purchased something from me in the past that you would love to learn how to make yourself! The first DIY project will be later this week so stay tuned! If getting your hands dirty isn’t your thing but you would still love to have any of the items I’ve posted, let me know under comments and I will see how we can make that happen. It’s pouring in So.Cal…stay safe out there! I lOVE dressing my tables. Whether my dining room or coffee table, adding homemade items or found treasures is such a blast for me. Here are some table top examples that you can implement with your own treasures! First is my coffee table. This lap (TV) tray can have so many uses. Either to decorate or as a lap tray for a meal or quick snack or even as your kids tray to do their homework, this DIY wood tray is a favorite. Baskets work just as well to house the items you love. I also use a lot of lanterns. I look for different styles I can use. The one shown here was found at one of my favorite Nurseries, Myrtle Creek in Fallbrook, CA.. Add a Candle, a plant for softness and you have a grouping. This is my dining room table with an Industrial Farmhouse Tray I made from distressed wood adding casters for easy use! I use this tray all year around and decorate for the Seasons. You can also put your plates, napkins or wine glasses..anything goes. When I do the DIY for this tray, I’ll post some fun photos of friends and how they have decorated theirs!! The plants are from Pottery Barn and a couple accessories from Magnolia Market but the silverware were my grandmothers as well as the salt shakers. I love being able to display my grandmothers items on my table. Small tables are fun..I love stacked books adding plants in zinc containers that adds to the industrial farmhouse decor. This table top is actually the top of my Antique Hutch and I wanted to show it because it’s symmetrical, something I don’t do that often unless on a hutch, fireplace, long table. But to me what makes the biggest statement is not the hutch but the Barn wood over it. It was actually from my Grandfathers Barn he built himself…One of the favorite things in my home.If there was a fire, it goes!! Symmetric arrangement with the clock and two candle sticks but the pride and joy of my house is my Grandfather, Pop, Barn wood hanging above the hutch. I wanted to show this because this is a surface you can decorate and in this old tool box top, I found again at a garage sale.. you can do an arrangement of faux succulents and moss. Forever Floral in Murrieta, has a real variety of succulents for you to make your own arrangement or they will do it for you. Think of different ways to display succulents. You can use anything from a old tin can to a wood box or even a shell . Just Try it! I personally don’t like making this permanent. I like to change out the succulents with different items like candles. This is a sweet little grouping, simple adding what I call your surprise color. (Surprise color is a color you will use throughout your home in every room in some capacity). In our living room, I have the navy blue in the pillows and a couple pottery items and that’s it, but you would think it’s a major color..that’s why its a Surprise! Love Industrial Farm Decor. Doug took this photo of the Bonsall Bridge in Southern Ca. I’m so lucky to have a photographer in the family, right! We printed the picture on lightweight aluminum and mounted to distressed wood with rusted metal brackets. The wood was found at a fencing company and in pretty rough shape. Cleaned, sanded, and waxed. It’s beautiful. The cool light I bought at Forever Florals, in Murrieta CA. Love it. Added some old chains ( barn sale) and favorite books on my antique chest and you’ve got a great arrangement.! . So this final grouping is a photo of Doug and I on our 42nd anniversary with sea glass and a shell we collected on the beaches of Tulum, Mexico… Make it personal! This tells a story..how fun is that! You can always copy Pottery Barn but also use your own personal items that have meaning to you! OK, so did you notice that my table top groupings have the same rules as the wall groupings , with a few exceptions. Have Fun with your table tops. Make it about your family and not something you saw in a magazine or a TV show. Use that for Inspiration for sure, I do, then just Personalize. Make it your own and send me pictures to share! How fun! Each month I will do a whole blog on some of my favorite shops and different companies I work with in Temecula Valley and surrounding areas. I want to promote these wonderful hardworking entrepreneurs so they get the exposure and you can visit yourself finding treasures of your own. 2016 has been a tough year for many. I know it’s been challenging for me as well but as I look back, this is for me the Best of 2016. I know that my Family, Faith and Friends have made 2016 incredible. My Family, my Doug, my constant, he encourages me and pushes me forward. He’s like a golden retriever so when I say what if we do this project, he says,” Is that We, or Me” but then he makes it happen.. Love this man! My kids, my sons Josh and Ian give me grief, but I know they’re proud of me by the little things they say and do. They actually like the Industrial Farm design so that’s very fun. I love them to pieces. They also had amazing taste when choosing their wife’s, and Suzanne and Kristen…My gosh they feel more like friends then Daughter in laws and I know they support me in all I do. Plus I love helping them in different projects we come up with. What a blast. My Grand kids, Shane, Luke, Madi and Hannah, well they are my second chance. You Grandma’s know what I mean so I will spoil, spoil, spoil and enjoy every bit of it. My Faith, is my foundation, “ As for Me and My House, We Will Serve the Lord”. My Faith has been the Cornerstone for Doug and I these 45 years and will continue to guide us in all we do. No matter what rotates around me, God is my constant. My Friends, (extended Family) , are my prayer warriors, my sounding blocks, my DIY buddies, and without our friends my gosh, I think that’s why Scripture tells us to Not Forsake the Fellowship of the Brethren, because our community of friends are our support in all we do. The encouragement I receive from my friends is endless in my many Decorating endeavors whether in making Barn Doors, to my Christmas Decor, you’ve always been there for me. This sign was an easy project and I bet you can do the script better than I can. Tape off edges and download stencil or freehand. Add hooks and there you go. So I do say Thank You and I know 2017 will be even better..so looking forward for what’s to come! This saying was my Moms and I had it made into a sign for Christmas Gifts. this was made not by me but a friend of mine, Kelly Rideout. I’ll be doing a blog just on her and her company very soon so stay tuned. I actually HATE this day for a lot of reasons. First, its a whole lot of work, right! For me I start decorating in late September because that’s my business, Christmas Decor and my annual boutique is usually late October or early November. It’s just normal in our household. Second, it’s sad. I love Christmas and it’s kind of like Post Christmas Blues a little. Third, storing all my stuff has become a movement of sorts. I always try to give away a lot of my older items but I seem to make something that I don’t want to sell and I keep it…poor Doug. The good thing is when it’s all done..what a blessing to have a clean slate. Decorating ideas start popping into my brain and what DIY projects to I want to start first. Again poor Doug, this means he’ll probably get drug into another Home Improvement project. I’m laughing because as much as he dreads it, I know he loves the outcome. I need to not overwhelm the poor guy. Its not even January yet. Not for 2 days then..Let’s get busy!